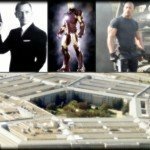 The first movie to film at CIA Headquarters at Langley was Scorpio in the early 1970s. 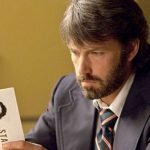 The last major film was Argo in 2012. 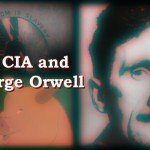 Sometime in 2014 the CIA stopped letting film-makers shoot footage on the CIA campus. This week I examine this decision by analysing the last two films that were granted access to Langley – Game of Pawns and Dying of the Light – and try to figure out why the CIA are now refusing to allow Hollywood to access their most powerful cinematic asset. But first things first – how do I know that you can’t film at CIA headquarters any more? I found this out when listening to the DVD commentary for Mission Impossible: Rogue Nation, the most recent in that series of films, released in 2015. Before I play that clip we should note that the first Mission: Impossible film in 1996 was granted access to Langley – before the sequence where they break into CIA headquarters to steal the NOC list there is an establishing shot of the fire truck pulling up to the headquarters building. In preparing for the third film in the series Tom Cruise and I think JJ Abrams visited Langley and talked about making the movie very pro-CIA. Tom Cruise was also the original star attached to Salt, when they spoke with Chase Brandon’s replacement Paul Barry. Cruise couldn’t see how the character differed enough from Ethan Hunt in Mission: Impossible, so he dropped out and eventually was replaced by Angelina Jolie. That was the director Christopher McQuarrie talking about how they had to take the establishing shot of Langley from another film because you’re not allowed to film at CIA headquarters any more. They could only include that shot because they took it from another Paramount Pictures movie. This seems to prove that getting footage of Langley without the CIA’s permission is basically impossible unless the studio already shot it for previous movie (they say Clear and Present Danger but it’s actually from Patriot Games). So, who has been allowed to film at Langley? The producers of Scorpio including director Michael Winner, back in the early 70s. We see our CIA agent character driving through the gates, parking the car and going in via the main entrance to the old headquarters building. He then walks past the stars on the wall, over the CIA seal and through the security gates. Later that decade a CBS news crew were allowed in, following the CIA establishing their Office of Public Affairs. Likewise the movie Telefon in 1977 was the first movie to feature an aerial shot of Langley. In the 80s they basically had no interest in Hollywood but then in 1992 Patriot Games was allowed to film the second of these almost identical ‘money shots’ of the guy driving up, going through the doors, across the seal on the floor and through the security barrier. This same basic sequence appears in later films, though some like The Recruit didn’t film at Langley, they simply recreated the interior lobby on a soundstage after visiting the CIA and taking pictures. The next full recreation was in Argo, when we see Ben Affleck doing the driving and the walking. Apparently they had to digitally remove the new security barriers and replace them with 70’s-style ones to keep it realistic. We also had the first Mission Impossible film, as I mentioned, and after Argo we had Top Chef in 2013, where the contestants got to cook in a kitchen in CIA headquarters and had real CIA people including Leon Panetta chow down on their efforts. Then we got the 2014 low budget spy thriller Dying of the Light, which was the first film since Patriot Games to feature a full helicopter flyover (or possibly a drone flyover). You can tell it’s new footage because you can see the new buildings they’ve added. Finally we have the low-budget government informational drama Game of Pawns, which was the last film ever to shoot at Langley. However, we also have things like Homeland, The Interview, 24, The Black List and, bizarrely, Kill the Messenger, all of which feature aerial footage of Langley. It all appears to be the same aerial footage so this is most likely to be stock that the CIA provides to the producers through the entertainment liaison office. We know that ex-CIA people worked on The Interview, The Black List and Homeland, and Homeland and 24 definitely had full CIA support, and I’d bet my right testicle The Interview did too. I’m not sure how Kill the Messenger fits into all this. Then we have the Bourne Trilogy, the first of which features a similar helicopter panning shot, but it’s at night. The other two also feature establishing shots of Langley that appear to be very early in the morning when it’s still quite dark. I’ve never seen these in any other movie, so I’m not sure whether these were custom-shot or provided by the CIA from their stock footage collection. 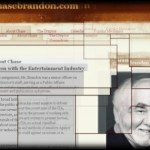 Chase Brandon only credits himself as working on the first of the trilogy, and even he denied that in an earlier interview so it’s difficult to know exactly how much involvement the CIA had, but I think they supported all three movies. Dying of the Light was released in 2014, and was a total flop. The writer-director Paul Schrader said that the studio re-cut the film that he’d shot before releasing it, and the result is a mishmash with some good elements but mostly just confusing inconsistencies. Basically, Nicholas Cage is a veteran CIA officer who 20 years ago was captured and tortured by terrorists and the story is about him trying to get revenge on them while also suffering from early stage dementia brought on by the torture. The only thing that’s remarkable about Dying of the Light is that they filmed at Langley. And that elements of the film are almost identical to the earlier CIA-sponsored movie The Recruit. The Recruit, at least in its original form, was ghost-written by CIA Hollywood liaison Chase Brandon, who remained involved throughout the production process and was on set in Toronto as a technical advisor. 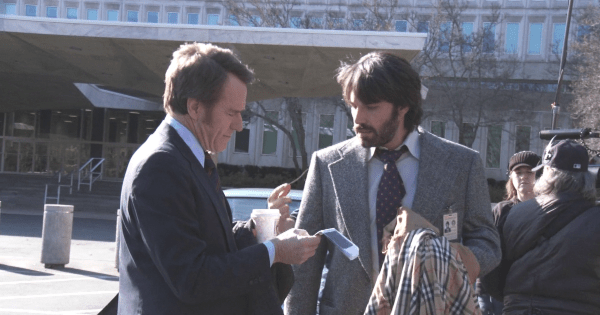 In short – the CIA had a major creative influence over that film. So you can imagine my surprise when I watched Dying of the Light and saw one scene that’s almost identical to a scene in The Recruit. Both scenes take place at the CIA training facility known as The Farm, and in The Recruit it is seasoned veteran CIA instructor Al Pacino giving the lecture, in Dying of the Light it’s the same character played by Nicholas Cage. But the lectures they give are very similar indeed, so let’s give them a listen. First, The Recruit. While there are some differences in tone, and Nic Cage comes across as a little unhinged while Pacino is always calm and in control, it’s basically the same scene. We, the audience, are inducted into the CIA via the mechanism of an introductory lecture for new recruits. Both scenes emphasise how the CIA is a moral organisation, full of people doing their duty for their country. While The Recruit then goes on to show CIA officers torturing recruits and other evil things, and Dying of the Light shows Nic Cage basically losing his mind and going rogue, these are nonetheless powerful scenes of indoctrination. Indeed, before we move on to Game of Pawns I just want to draw out another comparison. 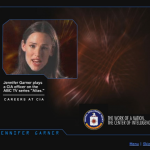 Around the time The Recruit came out the CIA also produced the infamous Jennifer Garner recruitment video. Garner was recruited for this job by Chase Brandon, who she was also working with on the TV series Alias. So bearing in mind the two scenes we’ve just listened to, this is her recruitment video for the CIA. The running theme throughout all this is that people join the CIA because they’re good people with a sense of duty and responsibility. Also that 9/11 shows how we need the CIA more than ever, even though they were the primary agency who failed to prevent the attacks. And I mean that literally – even if people like Rich Blee and Tom Wilshere were trying to make 9/11 happen or help 9/11 happen, others within the CIA failed to figure this out and stop them. I don’t know exactly what Cofer Black, head of CIA counter-terrorism, and director George Tenet knew about what Blee and Wilshere and the rest were up to. But whatever they did or didn’t know, this happened on their watch. It’s not as though it was only people inside Alec Station who knew about the Malaysia summit and failed to do anything with the information about Al Midhar coming to the US. Naturally, none of that makes in into these promotional films. Game of Pawns is a 2014 government information film produced on behalf of the FBI, who uploaded it to their youtube channel, which is where I found out about it. Unlike most government information films it portrays a dramatic story, rather than the usual documentary or news-style format with voice over. 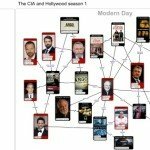 Rocket Media, the company contracted to make Game of Pawns, have made a few of these films, mostly with the FBI, including one called Betrayed and another called The Company Man. Their client list is mostly government agencies including several different parts of the DOD and other federal departments, along with organisations like the International Association of Chiefs of Police. Game of Pawns tells the true – or at least somewhat true – story of Glenn Duffie Shriver, a young American student studying in Shanghai who was recruited by Chinese intelligence and told to infiltrate the CIA. He applied for a job with the Directorate of Operations and was almost the whole way through the hiring process when he was arrested trying to leave the country on a plane bound for South Korea. The CIA and FBI knew he was a plant by Chinese intelligence so at no stage was there any genuine risk he was going to be able to infiltrate the Agency. Shriver ultimately pleaded guilty, was sentenced to only four years and served only three in prison. He’s out now. Three years. For trying to infiltrate the CIA on behalf of Chinese intelligence? So obviously this was a big success story for the FBI and the CIA – they stopped a would-be spy in his tracks. Those pesky Chinky Commies couldn’t get past the noble men and women of the US intelligence community. So why not spend $650,000 making a short spy thriller to try to convince young American students to not become spies? Why not spend even more on FBI-branded mousepads, coffee mugs, pawn-shaped water bottles and stressballs – even draw-string bags for you to keep your chess pieces in – all kinds of promotional tat. But let’s get to the video itself, which is about half an hour long so I’m not going to play the whole thing. The most important part is when Shriver goes to his interview at Langley. This sequence is especially dumb – because Shriver should have known he’d be drawing more attention to himself by doing this. If he’d just completed the polygraph, even if he failed it, then he’d just be some guy who didn’t get into the CIA. Instead, he made it really obvious that he was dodgy. While some of this sequence was filmed at the real CIA headquarters that didn’t stop the producers from doing really stupid things – such as when Shriver leaves Langley and we watch him go on the CCTV, the timecode says it is nearly 9pm, when it’s clearly the middle of the day. So why was this video produced? The FBI’s Counter-Intelligence division commissioned it, supposedly as a warning to young American students like Shriver. But the film portrays Shriver as kind of an idiot, and we have to wonder whether he was being watched by the CIA and/or the FBI for a long time before he was arrested. They certainly seemed to realise as soon as he applied for the CIA job that he was a spy, and they say this didn’t come through background checks. So were they monitoring his communications? Was the whole thing only allowed to get that far so they could embarrass Chinese intelligence? Were they intending to recruit him as a double agent and get him to send disinformation to his Chinese handlers? Why did he get away with such a short prison sentence for what, on paper, is a serious crime? Also, Game of Pawns is bad. The acting, directing and the script are all poor – they rather obviously used Chinatown in Washington DC as a stand-in for China, it just isn’t very well crafted and certainly wouldn’t persuade anyone to turn down the opportunity to become a spy. It’s a total failure as a piece of cinema, and I don’t say that very often. So was the video, and indeed the whole operation, more about mocking Chinese intelligence’s attempts to infiltrate American intelligence? I think this is why you’re not allowed to film at Langley any more. The CIA’s Office of the Inspector General carried out three investigations into the CIA’s relationship with the entertainment industry in 2012. The major report says that only one production – presumably Argo – had been granted access to Langley between 9/11 and the investigation. I’m not 100% sure that’s true but assuming it is, Argo was a big budget movie, a critical success and an Oscar winner. Dying of the Light is a half-butchered movie that could have been good, but isn’t. Game of Pawns is a steaming pile of crap. Even though these last two films portray the CIA well, they themselves are low-grade productions that devalue everything in them by being so poorly made. 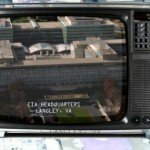 So I think the CIA recognised that their most valuable cinematic real estate – their headquarters – was being overused and if they kept on doing this it would reduce its value as a cinematic asset. So they made a decision – no one is allowed to film at Langley any more, or at least until it becomes a rarety or a novelty, until it regains some of the mystique and allure that it loses by appearing in any old piece of crap film made by halfwits being paid by the FBI.